A Chinese expert on religions has slammed an article claiming that Sakyamuni Buddha was actually of Chinese origin, saying it lacks evidence and is an abuse of patriotism. The article has been spreading on China's Internet since late 2017, after several studies in recent years made similar claims. However, other experts said the article contains reasonable points, and that Sakyamuni's origin has nothing to do with India. The article, which has gone viral on the Chinese Internet since January 1, claimed that a Nepalese scholar named Amuhanson discovered that Sakyamuni, the founder of Buddhism, was actually Chinese, and not of "Indian nationality", a fact that had been "spread by international academia for over 1,000 years." It is generally accepted that Sakyamuni was born in Lumbini in modern Nepal. According to UNESCO, Buddha was born in 623BC in the sacred area of Lumbini, which is "located in the Terai plains of southern Nepal, testified by the inscription on the pillar erected by the Mauryan Emperor Asoka in 249BC." "Amuhansong" also said that "Nepalese are Shennong's descendants, and are not the same race as modern Indians." Shennong is the Chinese God of agriculture. The article was widely shared on Chinese blogs and other media platforms. However, apart from the online article in Chinese, no other information about "Amuhansong" or his studies can be found online. The Global Times reporter found the same article on sohu.com dated to November 2017 without mentioning any Nepalese scholar. The sohu.com article suggested it was originally written by Li Liangsong, a professor from the Beijing University of Chinese Medicine and an expert on Buddhist medicine. Li listed 10 main reasons for his claim, such as the fact that Nepal used to be a "special district" of the ancient Chinese empire, and the content of Buddhist Scriptures shows the culture originates in Central China. "As far as I know, local Tibetans and people from central China are from the same ancestors, so saying Sakyamuni is Chinese might be reasonable in some senses," Hu Zhiyong, a research fellow at the Institute of International Relations in the Shanghai Academy of Social Sciences, told the Global Times. "Regardless of whether the Nepalese scholar is right or not, (such a discussion) has nothing to do with India, which has always wanted to show that its history is longer than China's," Hu said. "There is no proof that the Buddha was Indian." Li is not the first person who has tried to prove that Sakyamuni was Chinese. One influential study that he referred to is "Rethinking the Origin of Buddhism" by Zhang Rubai, a mineralogist from Chengdu University of Technology at Southwest China's Sichuan Province. Zhang believed that Buddhism spread from China to Central Asia and the western regions through India, and later came back to China's interland. His study was published in the journal of Chengdu University of Technology in January 2016. According to the journal, Zhang's findings were based on "Buddha figures carved on jade and ivory wares," as well as "a crystal Buddha head" from the ancient Shu Kingdom, which could be traced back to 1,000BC. 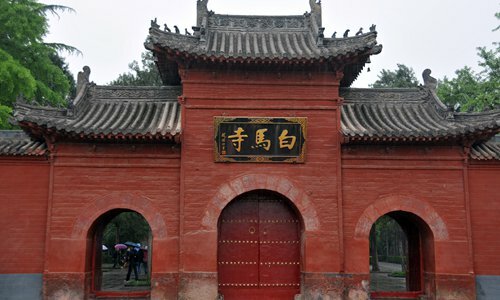 The kingdom is located in present day Sichuan. In 2009, Zhang published a book on these cultural relics "unearthed at the Sanxingdui ruins." However, the Sanxingdui Museum in March 2016 slammed Zhang by saying on its Sina Weibo account that none of the relics in his book were from the ruins. The museum said Zhang had fabricated the contents and written nonsense by claiming that Buddhism originated in Sanxingdui. "We've never seen anyone so shameless," the Weibo post wrote. Online sources showed that Long Xijiang, a research fellow at the China Tibetology Research Center, has published claims that Buddhism stemmed from the primitive Shamanism of Northwest and Northeast China. "I could not see the meaning of the (Sakyamuni being Chinese) study," said Shen Guiping, a religious expert at the Central Institute of Socialism in Beijing. "Such studies are invalid and their methods are improper… if it is to show patriotism, it is arrogant," Shen told the Global Times, "such a sense of national pride needs to be controlled, otherwise it would be abnormal and even dangerous." There are three language families of Buddhism - Han Buddhism, which entered inland China as early as 2BC; Tibetan Buddhism, which entered Tibet in the seventh century from India; and Theravada Buddhism, which entered what is today the south of Yunnan in around the 7th century from neighboring Myanmar, according to the website of SARA.